Many homeowners believe that ventilation is only important in the summer, but it is just as important in the winter! 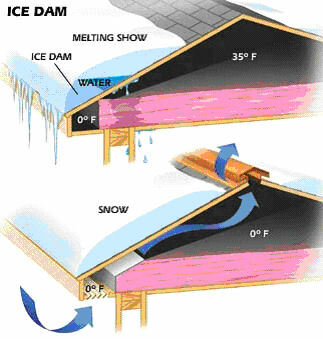 Did you know that the primary cause of ice dams is lack of ventilation, not necessarily lack of insulation? Ice dams are barriers that occur near the gutters and eaves of the roof, causing water/ice to back up under the shingles at the drip edge. The cycle begins with heat being trapped in the attic (lack of exhaust ventilation) which traps heat in the upper attic near the ridge. This condition melts the snow/ice at the top portion of the roof and prevents the snow/ice from melting near the bottom of the roof (at eaves/overhangs). The melted snow/ice then runs down the roof and collects at the eaves where it freezes/refreezes, creating an ice dam. Large snow events are rare in Portland, but severe ice damming can cause the shingles, roof sheathing, rafter/truss tails and top plate to be damaged. If not fixed, the damage can cause mold and mildew. Although adding more insulation can slow down the heat transfer from the interior living space, the heat transfer will still occur and, without appropriate ventilation to take that warm air away, the ice dam will occur. It is important to note that your attic should be very close to the exterior temperature! A well-ventilated, well-balanced ventilation system ideally keeps the top of the roof and the bottom side of the roof close to equal temperatures, eliminating the conditions required to form an ice dam. Call me if you’d like an evaluation of the ventilation and insulation in your attic! Building science is my passion. Diagram courtesy of Connell Insurance. Our inspector, Nicole, was in architecture for more than 13 years! Ask her about ideas for remodeling and additions at no extra charge when she inspects your home.